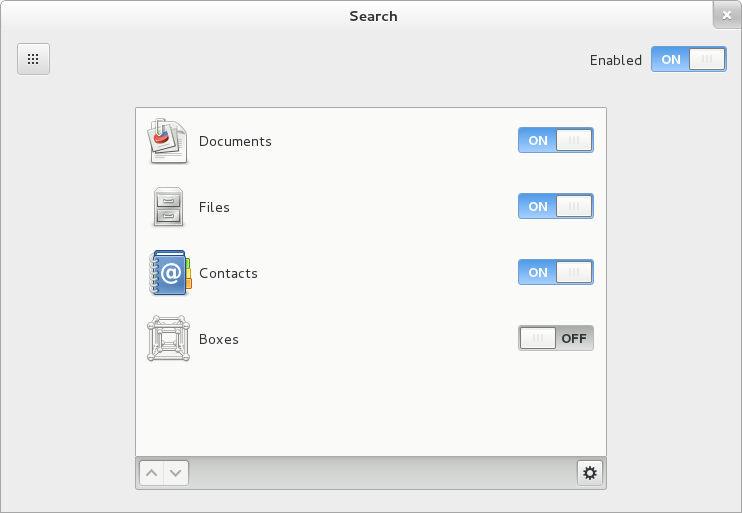 Search improvements in GNOME 3.8 — Cosimo’s blog. 1. Picture #1 – search in Documents vs search in Files. That’s confusing. Documents _are_ files. Or do you mean online documents? 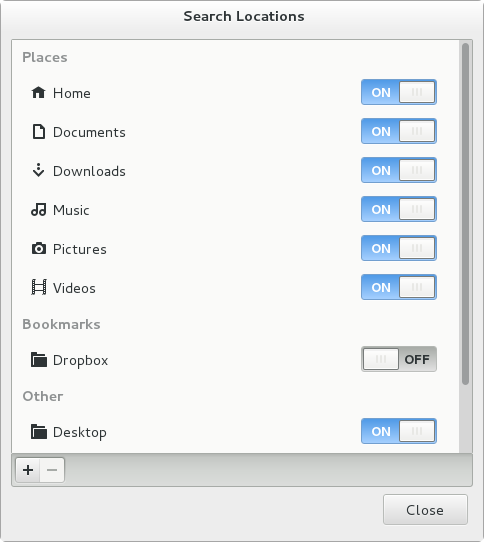 Please note that there are two types of “documents” in GNOME – one is an application called Documents and second is a folder Documents in Nautilus. It’s a bit schizophrenic here. And it’s going to be even more schizophrenic, because you’re working on “Music” and similar “apps”, right? 2. Picture #2 – search in Home vs search in Music. That’s confusing. The Music folder is located in my Home directory. So does “Home” mean just the top-level directory, no recursion? Or does it mean I can search in whole Home (and all subdirectories) _except_ Music, provided I disable that one? If I keep everything ON, but don’t add ~/Work specifically, will GS search in ~/Work by default or not? Could it be that the fade-out effect in the overview’s result list is a bit overdone? The screen cast gives me a massive tunnel vision effect. I’ve never been a fan of mixing application results with documents. While it makes sense to show applications and settings at once, the use case of searching for a document is totally different, as the user knows when is he searching for an app or other kind of result. Having a filter at hand and not having to go through settings windows would be a plus. Hey! I am really liking the progress. Looks neat and tidy and very functional at the same time. it seems, that when more than 7 applications are returned in results there is no way to see all of them. I don’t see any plus button or something like that. Also, most of providers give only small piece of information as a result. For example in 0:22 of your movie System Settings provider gives three one-word elements. There is a ton of screen real estate lost because of this. Maybe on higher resolution devices like desktop monitor, the results could divided in e.g. two columns. I have a huge FullHD 24” monitor. With this approach, and absurdly large icons I will see only handful of results, where in reality I could see much more. [WORDPRESS HASHCASH] The comment’s server IP (184.172.185.6) doesn’t match the comment’s URL host IP (216.172.170.11) and so is spam. It takes too much more vertical space and the entire horizontal space is wasted. They should have it aligned horizontally (but then again I am not sure how to show the complete names of files if aligned horizontally – may be as tooltips?). I hope someone makes an extension. This looks really good, excellent work! Just a question: I tried the original re-search branch and it had smooth animations where the search was sort of “maximized”. Since you’re typing, you’re certainly looking for an application hence it makes sense to focus on that, and I really thought it was nice. Did you decice not to keep it because it was too distracting? @Stiph: no, that’s something that is still missing. We plan to reintroduce it before 3.8. [WORDPRESS HASHCASH] The comment’s server IP (178.255.225.139) doesn’t match the comment’s URL host IP (213.162.217.198) and so is spam. We do need privacy! Hiding contacts when searching is great! Thanks. I am looking forward this feature! Nice work, however the results shown in the shell take really a lot of vertical space, causing a lot of scrolling. I hope they can be compacted a little bit more, and maybe the Nautilus-like “Grid” and “List” buttons added to the shell, to show results in these two modes. Different people have different tastes here. [WORDPRESS HASHCASH] The comment’s server IP (216.151.210.46) doesn’t match the comment’s URL host IP (66.155.11.238) and so is spam. We really need to be able to toggle search providers on/off in the dash rather than having to delve into the control center. As more search providers are introduced it is more likely that we will want to pick and choose between searches, rather than have a static list of search providers enabled all the time. Is there any information how to upgrade an extension which implements a SearchProvider from 3.6 to 3.7/3.8? Always listen to the community!, the community finally will use it and the community will have to be satisfied and happy with the work done. Never forget the community, the GNOME community!